JNN 03 June 2014 Sanaa : At least 25 people have been killed and dozens of others injured in clashes between Yemeni troops and Shia Houthi fighters in an area near the capital Sana’a. According to tribal and medical sources on Monday, seven Yemeni soldiers and 18 Houthi fighters were killed in the clashes. The sources further said that 16 Yemeni soldiers were wounded in the fighting. Ahmed al-Bekry, deputy governor of Omran province, said that Yemeni war planes bombed positions held there by Houthi fighters and army forces clashed with the rebels, killing around 18 of them. He said about 20 government soldiers were killed as well. They also noted that the deadly confrontation began as troops tried to expel a group of Houthis from a strategic area near the city of Amran. The Houthis blame elements of the Wahabi Islah party within government forces and in the Omran local administration for the fighting. Government officials say the Houthis, who have repeatedly fought government forces since 2004, are trying to tighten their grip on the north before next year’s election and as Yemen eyes moves towards a federal-style devolution of power to regions. Yemen’s Houthi movement, which draws its name from the tribe of its founding leader Hussein Badreddin al-Houthi, has been fighting against the central government in Sana’a for years. The Shia fighters blame the government for political, economic, and religious marginalization of the country’s Shia community and violating their civil rights. In February, the Yemeni government agreed to transform the impoverished Arab state into a federation as part of a political transition. This would create four regions in the north and two in the south. But the government’s plan was flatly rejected by both the separatists in the south and the Houthi fighters, who argue that the initiative would divide Yemen into rich and poor regions. 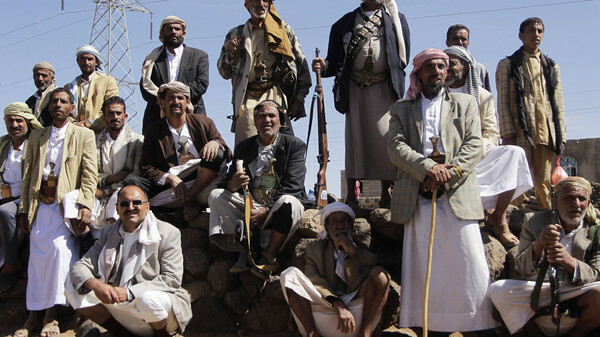 The Houthi movement also played a key role in the popular revolution that forced former dictator Ali Abdullah Saleh to step down in February 2012. This entry was posted in Middle East and tagged government forces, shia community, Shia Houthi Fighters, Yemen, Yemeni, Yemeni Forces, yemeni government. Bookmark the permalink.